The Portland Drill Hall is a large timber hall with a gun shed attached at a rear corner, built for the recruitment and training of the local volunteer militia. It was designed by the Public Works Department architect Samuel Bindley, and built in 1887 by G & A Findlay. The hall was used by the Portland Battery of the Victorian Garrison Artillery, made up of part-time paid volunteer members, for practising military exercises. The gun shed was used both as a gun store and for training in the use of heavy guns. The gun shed had ports in the north wall looking north-east towards the bay and the two 68 pounder cannons housed there could be aimed by moving them on curved traversing platforms. The hall was also used as a venue for community functions such as dances. The battery was decommissioned in 1905 and the group's artillery was removed, but the drill hall continued to be used as a local gathering place. From 1911 it was used by the Royal Australian Navy for the Portland Boys Naval Brigade, became the Star Picture Theatre until a new cinema was built in 1937, and was used as a textile factory for some years. 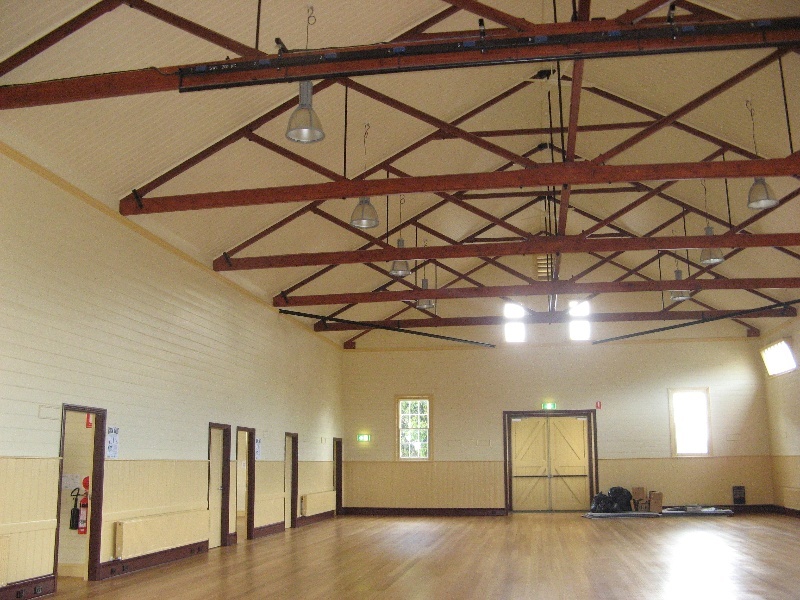 It was bought by Portland Council in 1971 and since then has had a number of uses: the hall for dances, meetings and as an indoor sports venue; the gun shed as a base for the local SES and later as the records room for the Glenelg Shire Council. The Portland Drill Hall is a large rectangular-plan weatherboard building, about 24.4 metres long by 12.2 metres wide, with a corrugated iron-clad gable roof. The hall is characteristic of Samuel Bindley's designs, with Queen Anne detailing and pedimented window surrounds. It has a gabled entrance porch at the west end and along the south side is a range of smaller rooms built as stores, offices and a lavatory. The wall between two of these rooms has been removed as have some of the original fireplaces. The original floor has been replaced. 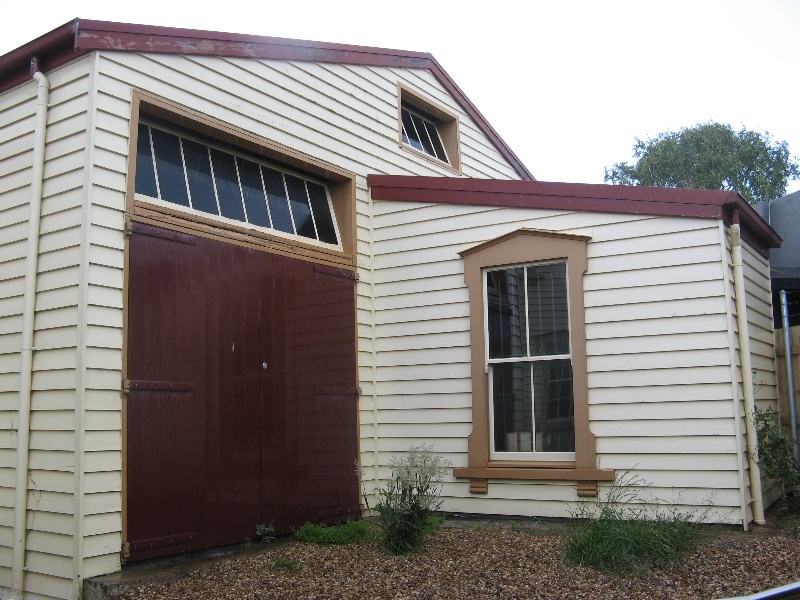 The weatherboard gun shed is located at an angle to the rear of the drill hall and is connected to its north-east corner by an enclosed passage. The curved traversing platforms in the gun shed are made of smooth-cut stone set into the floor. The shed underwent alterations when adapted to become Glenelg Shire Council's records department, with the alteration of openings and the addition of a small entry vestibule. This site is part of the traditional land of the Gunditjmara people. The Portland Drill Hall is of architectural and historical significance to the state of Victoria. The Portland Drill Hall and Gun Shed are of architectural significance as a fine example of the drill hall facilities designed by the Public Works Department architect Samuel Bindley and built in various locations throughout Victoria after 1870. The halls were built mainly to a standard pattern with local variations. This is the only drill hall in Victoria with an attached gun shed, and the stone traversing platforms are a rare reminder of its original function. The Portland Drill Hall and Gun Shed are historically significant as a demonstration of the central role played by the part-time volunteer militia within coastal towns such as Portland in the late nineteenth century. These militia were seen as an integral part of Victoria's defence system, and their importance is demonstrated by the scale of the buildings constructed for their use at Portland and the strategic location of these buildings close to the harbour and within the government precinct. The gun shed is significant for its siting overlooking the bay and for the remaining evidence of its use to accommodate and train the militia in the use of 68 pounder guns. 1. 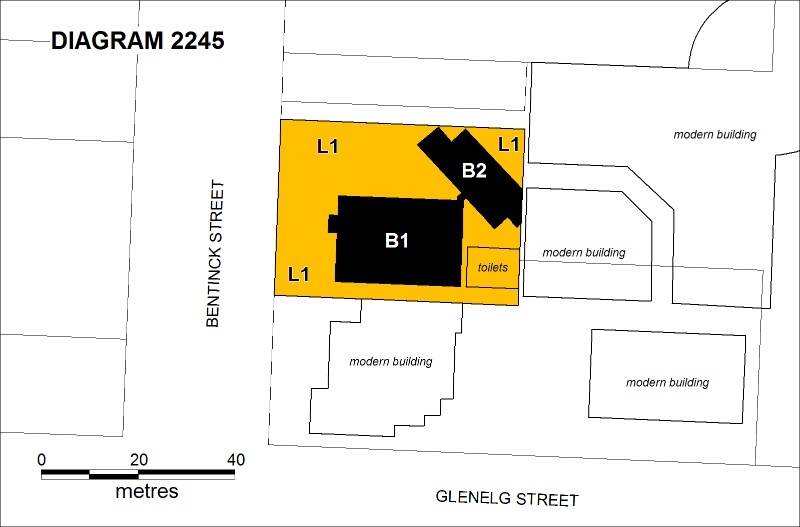 All of the buildings marked B1 (drill hall) and B2 (gun shed) on Diagram 2245 held by the Executive Director. 2. All of the land marked L1 on Diagram 2245 held by the Executive Director being part of Lot 1 on Title Plan 523901. Drill halls were constructed to accommodate the needs of recruitment and training of local militia or volunteer corps. The form of drill halls altered little from a basic pattern, with the differences in style large dictated by climate and the availability of materials. 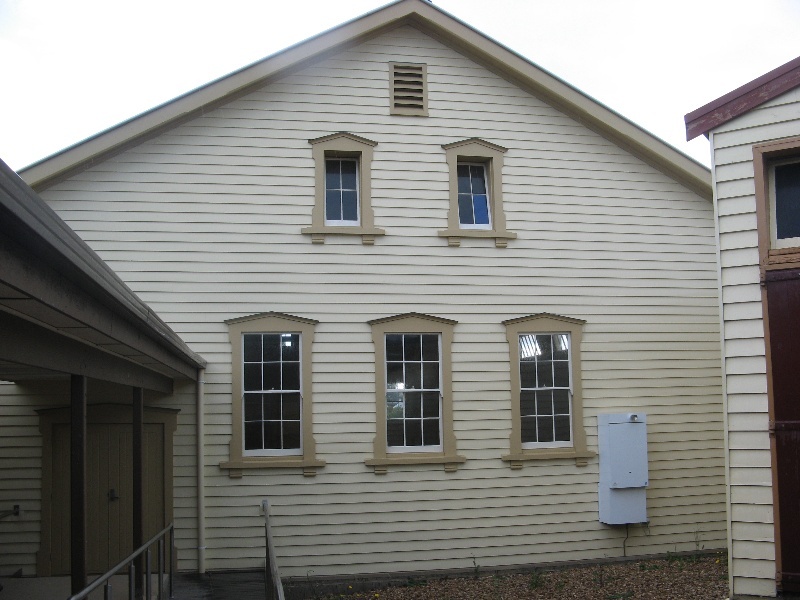 Prior to the assumption of defensive duties by the colonies in 1870 most volunteer units made use of existing buildings as drill halls, as few had the funds with which to build their own. After 1870 the colonial authorities began to construct drill halls for their part-time militia soldiers. Drill halls were required for the storage of arms and ammunition, to provide an orderly room for the administration of units, and most importantly to provide an undercover space to practise military drill. Most halls followed a standard pattern of construction related to the requirements of nineteenth century military art. Each hall required a large open room where an entire rifle company (over a hundred men) could parade and practise their drill. It would also require storage space for rifles and training equipment as well as administration offices. The early Victorian drill halls, such as those at Warrnambool (1868, H543), East Collingwood (1864, H1801) and Richmond (1867, H1362), were built to designs based on the individual units that constructed them and differ from the later group, many of which were built to a government dictated design with minor individual differences. This later design, seen at Ballarat (1885, H1949), Bendigo, Castlemaine (1888, H683), Geelong, Portland, St Kilda and Williamstown, was by the Department of Public Works architect Samuel Bindley, who had become the Public Works architect in charge of the north-west district of Victoria in 1884. His design had a Queen Anne character with decorative timber gables and verandahs. Portland's first volunteer unit was formed in 1859, in response to a perceived Russian attack during the Crimean War. It practised at first in a building 'adjacent to the sergeants' house in Bentinck Street' and later in the old immigration depot hall. This unit disbanded in 1863 but reformed in 1866 as part of the Royal Victorian Volunteer Artillery, and disbanded again in 1884 with the disbandment of the volunteer system. The Portland Battery of the 2nd Brigade of the Victorian Garrison Artillery formed shortly thereafter. It was part of the new part-time paid volunteer militia, which was to be better equipped and trained to minimum standards and meet minimum requirements for drill and theoretical knowledge. In addition to new equipment, standard uniforms and payment for time spent in training the unit was to have a purpose-built drill hall constructed in the north-west corner of what was known as the Government Block (now the Civic Precinct). It will have a frontage to the street named of about 54 feet. The main building will be what is termed the drill shed, which will be a fine room, the dimensions being 80 feet by 40 feet. On the south side of this will be a wing extending its whole length, which will be subdivided as follows:- Commencing at the east end there will be a store room 14 ft 6 in by 12 feet, a reading room 14 ft 6 in by 22 ft, non-commissioned officers' room 14 ft 6 in by 14 ft 3 in, office 14 ft 6 in by 10 ft, officers' room 14 ft 6 in square, and lavatory 10 ft by 4 ft 9 in. The whole of these rooms with the exception of the lavatory and storeroom will have provision made for fires. There will be a private entrance to the officers' quarters from the street. A porch leads to the front entrance of the building, both porch and drill shed being entered from the front by double doors. The drill shed will in the day time be well lighted by 7 windows 8 feet broad by 2 feet in depth on the north side, and four windows each in front and rear. Provision is made for laying on gas, which will be dispensed in the drill room by sunlights and fixed brackets. At nearly right angles to the north-east corner of the drill shed is the gun shed, which having its front elevation at the corner mentioned runs back in a south-easterly direction to the bowling green fence. This building will be 60 feet by 30 feet, and at its north end there will be a gun store 17 feet by 12 feet. As its name implies this shed is for the use of the heavy guns, ports for which are to be placed so as to allow two guns to look in a north-easterly direction on to the bay, providing the bowling green were removed. Provision is made in the contract for the fixing of two racers or traversing platforms to be supplied by the Government, so that it would appear the field guns at present in use are to be replaced by guns more suitable to the nature of the duties of garrison artillery. There will be an entrance by double doors and a passage from the drill shed to the gun shed. The material used in boarding up is to be 7-inch red deal, the doors and window frames are to be of pine, and the former in most instances panelled. The floors of all buildings with the exception of the gun shed will be of Kauri pine, while the floors of the latter will be composed of asphalt in three layers. All the rooms to be lined and ceiled throughout with the exception of the drill room, which will only have dado work 5 feet high running all around it. The drill room will be about 30 feet in height to the ridging sloping to about 16 feet at the eaves. Iron angle ties will embrace the corners of the two principal buildings. The material used in roofing will be corrugated iron of 24 gauge. In the gun room racks are to be provided for 130 rifles, and in the gun shed racks for 100 rifles in groups of 12. The timber roof trusses in the drill shed, the dado work in the same, and in the porch and passage leading to the gun shed to be stained, sized and varnished. The main building to be painted a light stone colour, and the fascias to the windows a darker shade of the same colour. Gas will be laid on all through the buildings. There is not much attempt at ornamentation of the front portion of the building, beyond cut and chamfered finials and chamfered collars to porch and front elevation of drill room. Then provision is made in the contract for 846 feet of picket fencing comprising three chains on the east side of the parade ground, five chains on the south side, three and a half chains on the west side along Bentinck Street, and two and a half on north side, leaving a path of 12 feet wide to the bowling green. This fence will be provided with double and wicket gates. Construction began in 1887 with the contractors being G & A Findlay for carpentry, the Burnet Brothers for painting and varnishing, and Benson & Hardy for masonry and asphalting. The opening was a major event in the town, as the building was a prominent part of the townscape and associated with the new militia that included over a hundred local men. The drill hall was used for drilling the town's militia forces in musketry and artillery. The hall was not only for training but also as a venue for many local functions, such as dances. The gun room allowed the militia to practise their artillery drill in the two 68 pounder cannon housed there. The canons were provided with firing ports that looked across the town hall to the bay. The Drill Hall and the Portland Battery continued to operate until 1905, when the battery was decommissioned. The remaining functional modern artillery and associated buildings were removed from the battery. 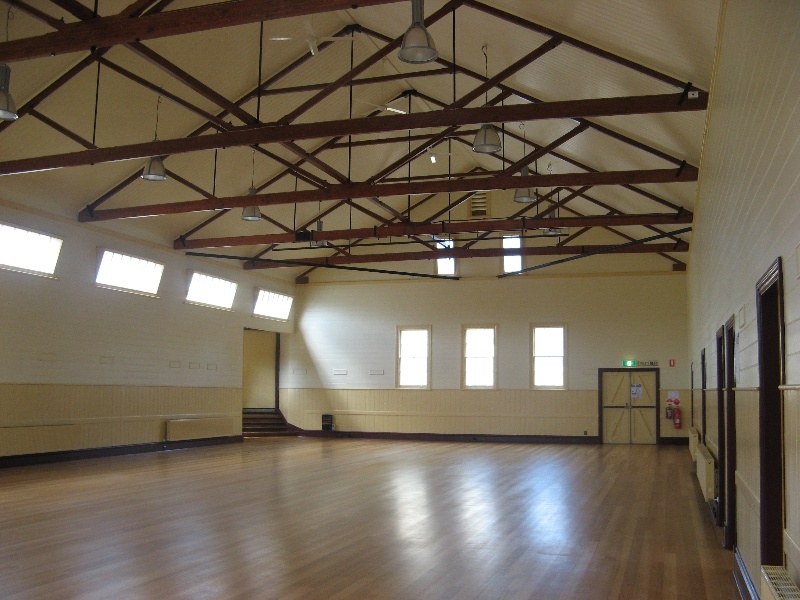 The drill hall continued to be used throughout the twentieth century as a public gathering place and function hall for gatherings and dances. The Royal Australian Navy used it as a base for the Portland Boys Naval Brigade from 1911 until the brigade's disbandment, when it saw various civilian uses including that as the Star Picture Theatre until a new cinema was build in 1937. 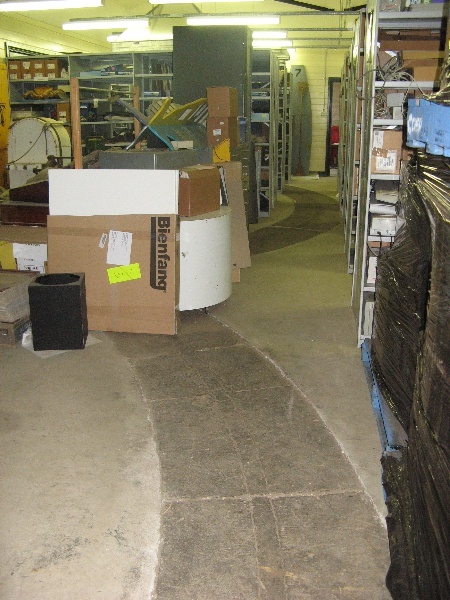 The hall was also used as a textile factory for some years, which damaged the original floors. It was bought by Portland Council in 1971 as a dance venue and a coffee shop for a while. The Portland Coasters basketball team also used the hall as their court from 1956-1967. 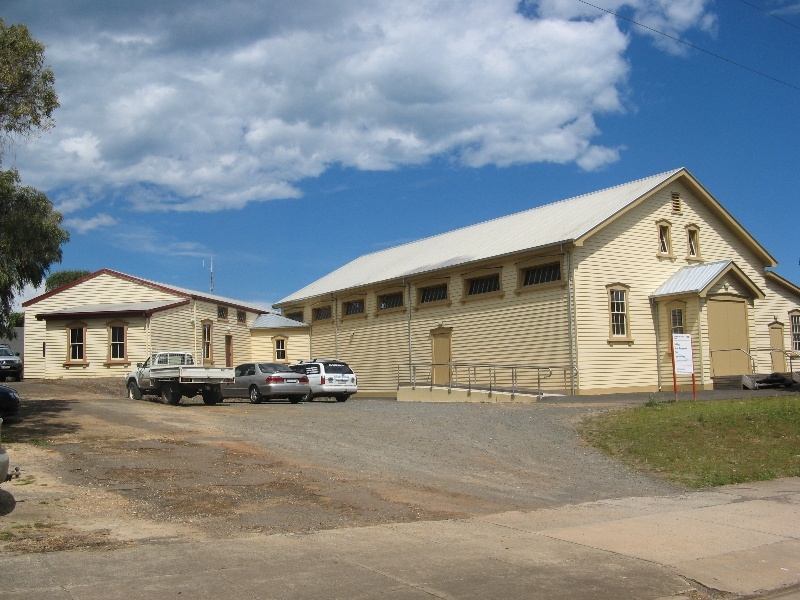 The main use since 1980 was of the gun room as the base of operations for the Portland SES and the hall for use by local youth groups, with renovations in the early 1970s seeing its use as an indoor sports venue. After the departure of the SES it was modified as the records room of the Glenelg Shire Council. Conservation works were carried out in 2009-10. Currently (2010) it is used for local sports training and as a meeting room for a youth group. It has undergone several changes, with the addition and removal of doorways, changes to the configuration of the drill hall annex rooms and changes in the configuration of spaces within the gun shed. The Portland Drill Hall and Gun Shed are historically significant as a demonstration of the central role played by the part-time volunteer militia within coastal towns such as Portland in the late nineteenth century. These militia were seen as an integral part of the Victoria's systems of defence and their importance is demonstrated by the scale of the buildings constructed for their use at Portland and the strategic location of these close to the harbour and within the government precinct. This is the only hall in Victoria with an attached gun shed. 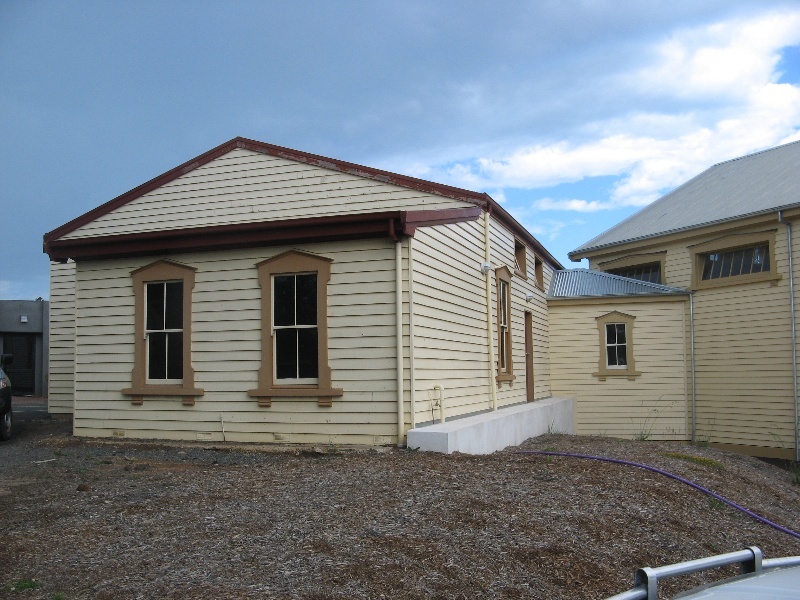 The Portland Drill Hall and Gun Shed are of architectural significance as a fine example of the drill hall facilities designed by the Public Works Department architect Samuel Bindley and built in various locations throughout colonial Victoria. The halls were built to a standard pattern with minor local variations. 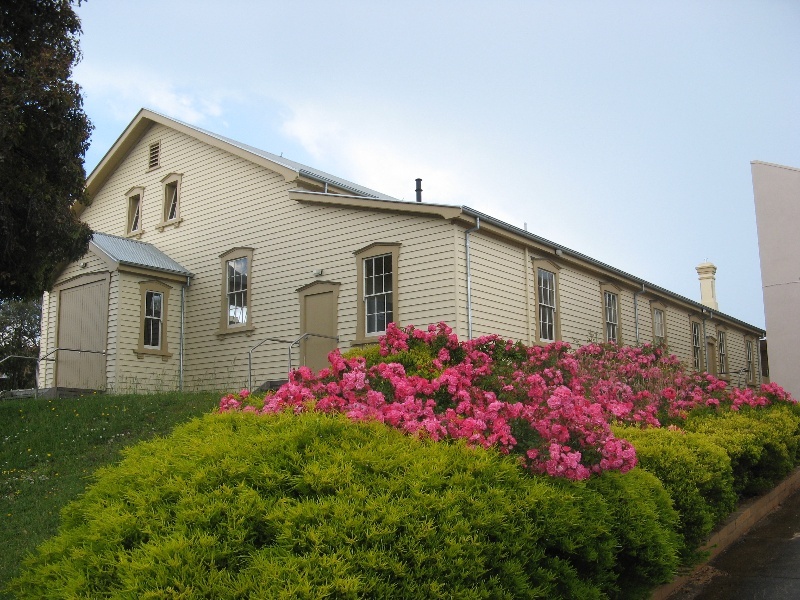 Designed by the Public Works Department architect Samuel Bindley and built in 1887 for the training of volunteer militia, this is the only hall in Victoria with a gun shed used for training in the use of heavy guns. General Conditions: 1. All exempted alterations are to be planned and carried out in a manner which prevents damage to the fabric of the registered place or object. General Conditions: 2. Should it become apparent during further inspection or the carrying out of works that original or previously hidden or inaccessible details of the place or object are revealed which relate to the significance of the place or object, then the exemption covering such works shall cease and Heritage Victoria shall be notified as soon as possible. General Conditions: 3. If there is a conservation policy and plan all works shall be in accordance with it. Note: A Conservation Management Plan or a Heritage Action Plan provides guidance for the management of the heritage values associated with the site. It may not be necessary to obtain a heritage permit for certain works specified in the management plan. General Conditions: 4. Nothing in this determination prevents the Executive Director from amending or rescinding all or any of the permit exemptions. General Conditions: 5. Nothing in this determination exempts owners or their agents from the responsibility to seek relevant planning or building permits from the responsible authorities where applicable. Minor Works : Note: Any Minor Works that in the opinion of the Executive Director will not adversely affect the heritage significance of the place may be exempt from the permit requirements of the Heritage Act. A person proposing to undertake minor works must submit a proposal to the Executive Director. If the Executive Director is satisfied that the proposed works will not adversely affect the heritage values of the site, the applicant may be exempted from the requirement to obtain a heritage permit. If an applicant is uncertain whether a heritage permit is required, it is recommended that the permits co-ordinator be contacted. The significance of the drill hall lies in its rarity and intactness as a fine example of the drill halls designed by the Public Works Department architect Samuel Bindley. The gun shed is the only example of its kind in Victoria, and the traversing platforms within it are evidence of the guns it once housed. All of the registered buildings is integral to the significance of the place and any external or internal alterations are subject to permit application. The extent of registration protects the whole site. The addition of new buildings to the site may impact upon the cultural heritage significance of the place and requires a permit. The purpose of this requirement is not to prevent any further development on this site, but to enable control of possible adverse impacts on heritage significance during that process.